So last weekend was my first go at baking since my most recent lung collapse! Apparently I don’t jump back into things slowly as I made Cupcakes, Cookies, Brownies, a Cake and Chocolates – all for a Baby Shower! 🙂 However, all was well and I thoroughly enjoyed doing it all! It was for my Boyfriends Sister, who fortunately came round the day before and helped me! I also had some help in the form of the Cake Pop Princess, who made the wonderful Rattle Cake Pops. When it comes to cake pops, I have officially hung up my apron! They literally give me nightmares, and anything I could have made would have been no-where near as good as these anyway! 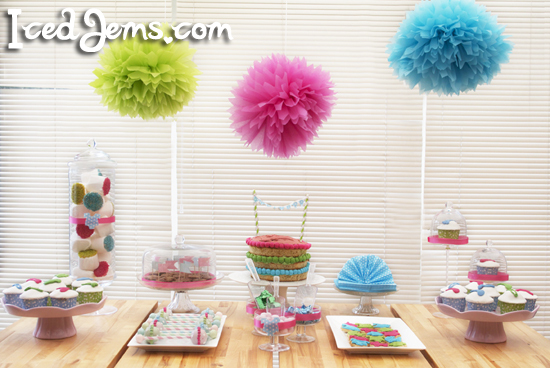 The bright Pom Poms were a real wow factor and talking point! Everyone kept saying how they would love to have them up all year, not just for a party! You can get them from https://www.icedjemsshop.com for just £7.99 for a pack of 3. 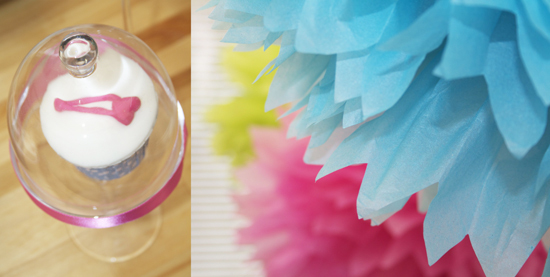 I made these super cute Baby Shower Sugar Cookies to match the pom poms using Baby Themed plunger cutters. I was going to leave them plain, but the coloured layer of fondant on top really made them stand out. I picked up the White Rectangle Plates from Morrisons for just £4 each, I also found them on the Next Website for just £4 too if you want to grab some! 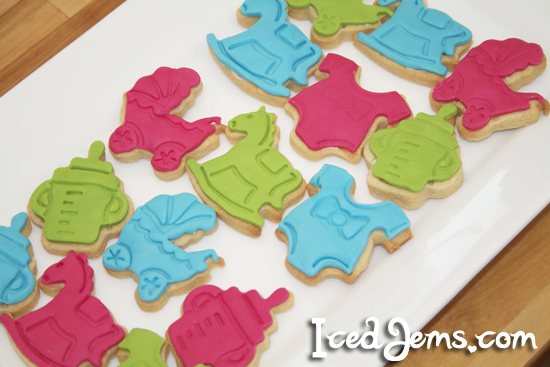 The plunger cutters to make the cookies are all available on my shop. 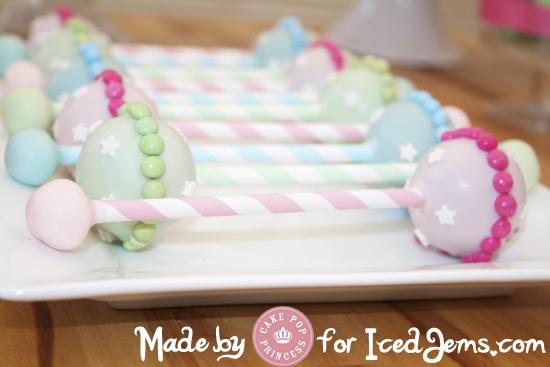 Next up were the Rattle Cake Pops! I asked the super talented Bianca AKA The Cake Pop Princess to make these, rather than me stay up until 3am making lumpy balls of mess on sticks hehe. Love the use of the Striped Paper Straws from my shop with these! 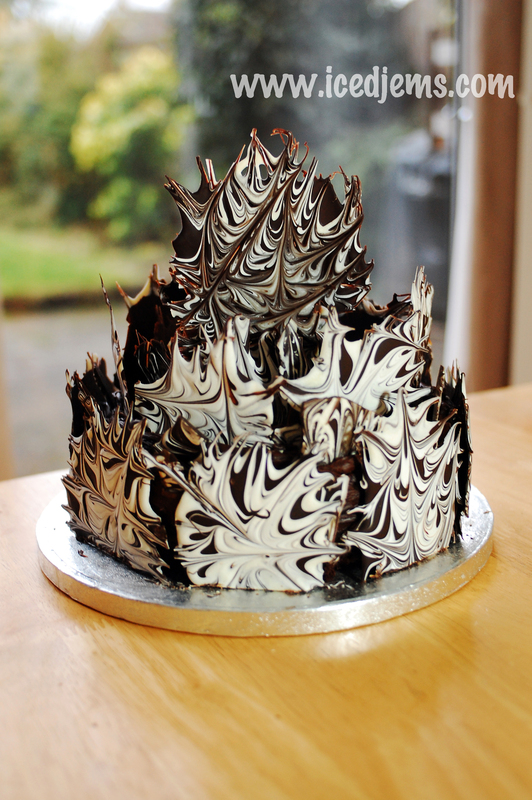 Now onto the cake, admittedly this wasn’t one of the most complicated cakes I have ever done. 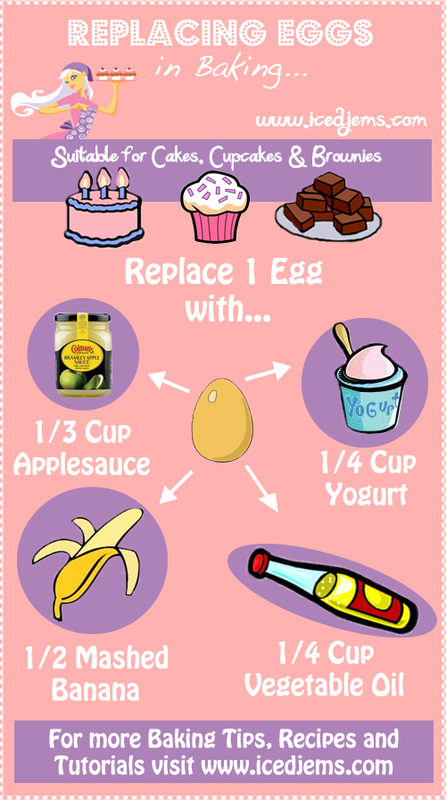 But I wanted to keep things simple with so much to make! 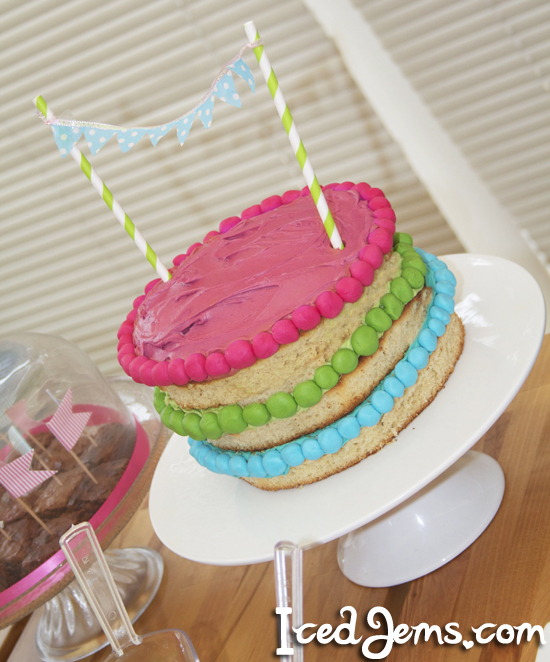 I made a vanilla sponge cake with vanilla frosting, then made my own Mini Cake Bunting using Paper Straws, Ribbon and tiny triangles I cut out from a serviette! For the cupcakes, I used my popular Polka Dot Baking Cups and baked Chocolate Chip sponge into them, covering with frosting and a layer of fondant. 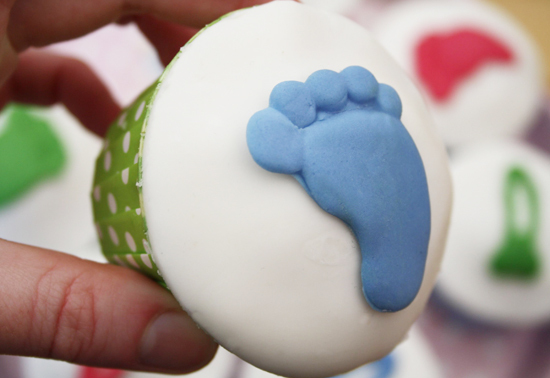 I then made cute Baby Feet cupcakes with the help of the Baby Feet Mould from my shop. 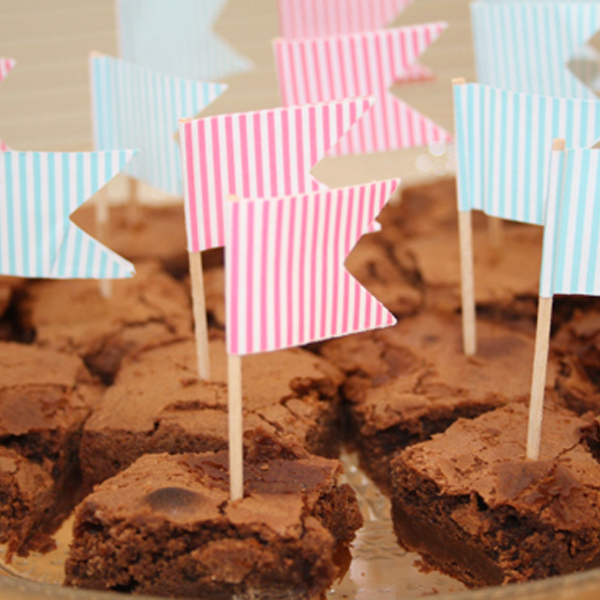 Brownies are a real classic I like to whip up at any event! They are so quick and easy and can fill up a lot of people if needed 😉 I used the pretty Stripe Flag Picks from the shop to decorate them. 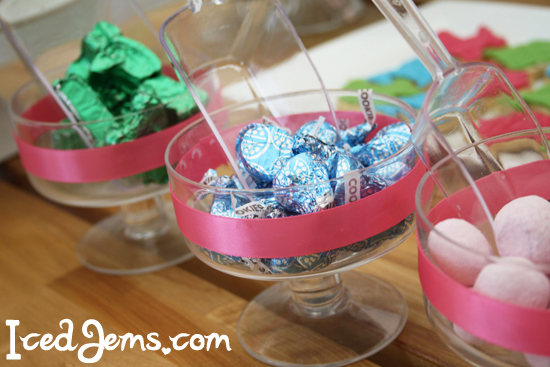 Its nice to have little sweets to pick at for any party, I decorated some simple glass dessert bowls with ribbon and filled with sweets that matched the party colours! The Sweet Scoops from my shop were a real nice finishing touch, and the Foil Sweet Wrappers helped me to keep the colours in theme. 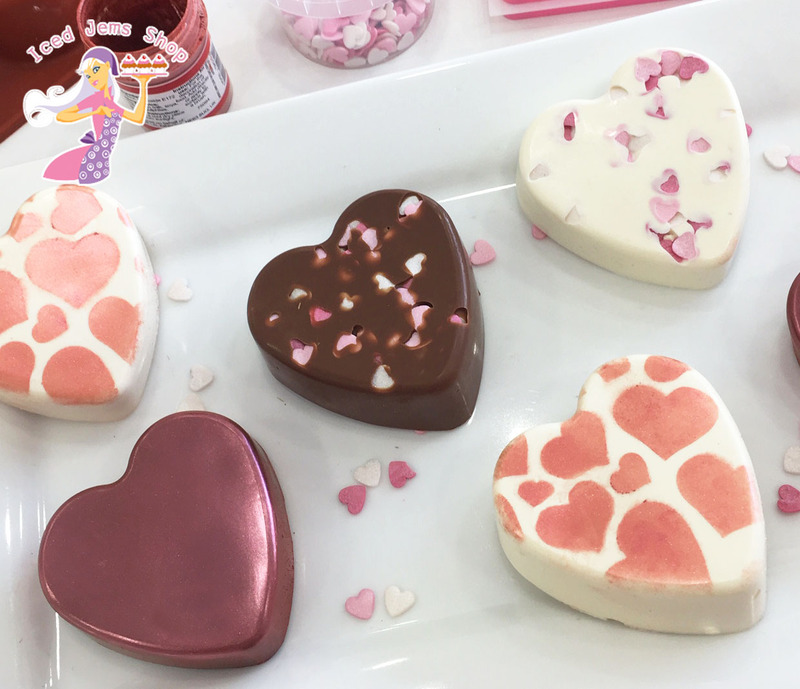 One of the glasses contained homemade chocolates I made using the Toys Silicone Mould, I loved seeing peoples faces when they opened up the foil to see a chocolate lego piece or chocolate rocking horse! 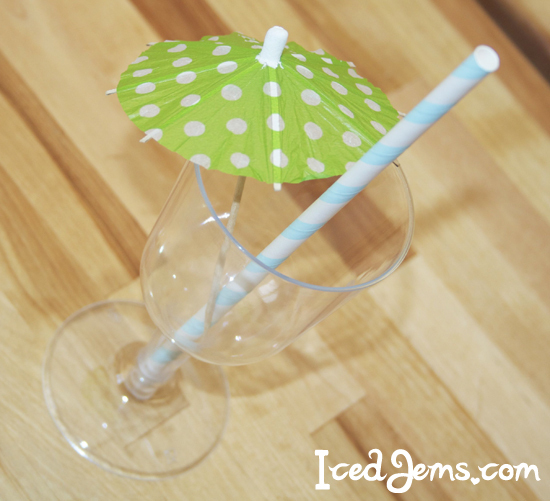 I though it would be fun if everyone had a drink to match the party, so I decorated plastic cups with the Paper Straws and Polka Dot Cocktail Umbrellas! 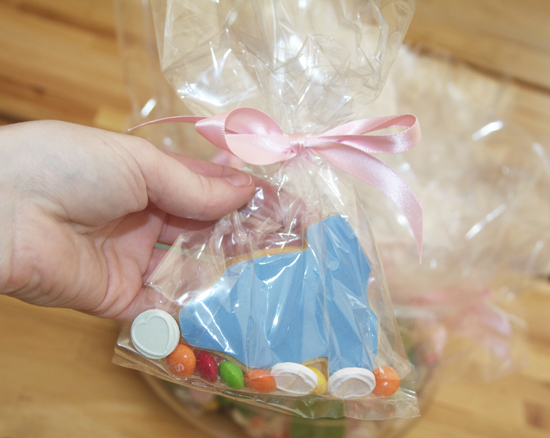 For take home favours, everyone got a cute Baby Themed Sugar Cookie and a few sweets in a Cellophane Bag (not that they could look at another cake or cookie once they left hehe). 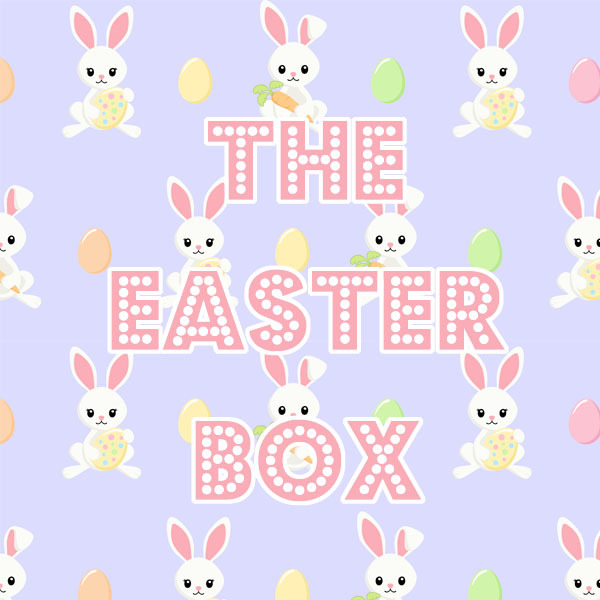 Hopefully I’ve explained how I made all the little details and you can follow these steps should you wish to re-create anything for your own party! 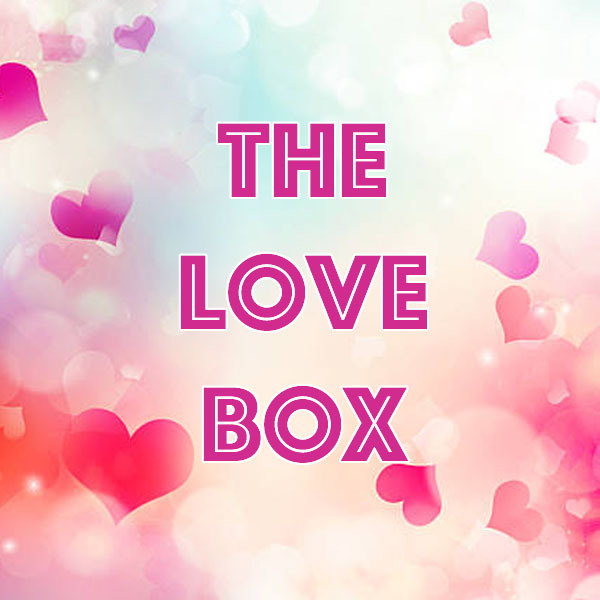 If you have any specific questions please feel free to comment below or ask me on my Facebook Page. That is so beautiful Jemma! Your website is great, your display/decoration stunning and your cakes delicious (thank your for bringing some at work). I’m looking forward to buying some stuff from your shop! 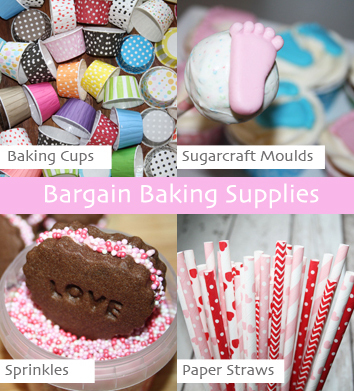 I bought the baby themed plungers I am hoping to make cupcakes for my nieces baby shower if I cover with a circle of the white ready roll icing then cut a coloured baby item what do I use to stick onto disc?